← Are You a Twitter Early Adopter? How Do Solo Bloggers Break into the Techmeme 100? A couple weeks ago, Steve Hodson at Winextra wrote a post that caught my eye. In Why today’s solo bloggers may not see Scoble-like fame…, he observes that the emergence of investor-funded professional blog networks (e.g. TechCrunch) will be the dominant industry structure going forward. Breaking the top end of that oligopoly will be tough for any solo blogger. However several solo bloggers are regularly in the Techmeme 100, as Steve notes here. It got me thinking about how someone’s blog goes from a little experiment to achieving a large audience and becoming influential. The stat above about 26% of Web users starting blog strikes me as high, but let’s assume there’s a large number of individuals starting blogs. From where I sit (far, far outside any kind of Techmeme rankings), I can envision three ways the influx of solo bloggers can break into the Techmeme 100. To be sure, there are other rankings beyond Techmeme. For instance, the Technorati 100 is a big deal. Political blog Huffington Post doesn’t show up on Techmeme, but it dominates the Technorati 100. The paths below apply to non-tech blogs and non-Techmeme rankings. Patience. Quality posts. Devoted long time fans. This blog experiences a series of big events that give it jumps in subscribers. Each events attracts a flood of new visitors, some of whom decide to subscribe. What might these big events be? I think that if a blogger emerges on the other side of these big events to have a wide following, there’ll be this sense that they burst on the scene. But like an actress who suddenly gets hot, you’ll never see all the bit parts and ‘B’ movies that she was in before. 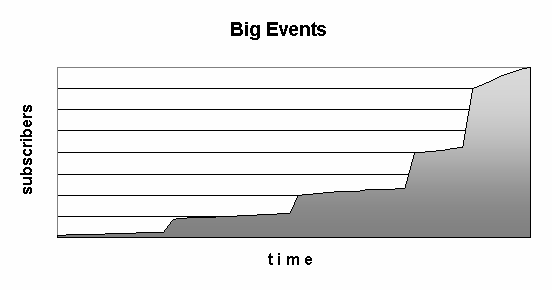 ‘Big events’ is the one that’s most likely to get solo bloggers into the big time. This is the path that requires the most luck. Marc Andreessen has proven to be quite talented at blogging. And it didn’t hurt readership that he had already achieved legend status based on Netscape. Imagine if Microsoft buys Yahoo and Jerry Yang decides to start blogging on his own. I guarantee that will get subscribers (I know I’d subscribe). Celebrities go right to the front of the line, but they’d better have blogging talent. 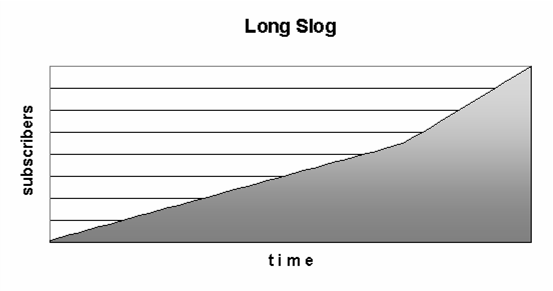 Long slog blogs are testaments to the love of blogging. Big events seem to be the most likely path for the next Robert Scobles and Louis Grays to emerge. 8 Responses to How Do Solo Bloggers Break into the Techmeme 100? As you know, the fact I’m on TechMeme 100 is at times odd to me. Trust me, I’m not complaining, but it can be quite a head-shaker to see my humble blog alongside the giant blog networks, Scoble, and the elite tech media. At the end of the day, it’s just me, blogging in the free time around work, family, etc. Getting on the TechMeme 100 means you need to represent at least .18% of all TechMeme posts over the previous 30 days. That’s essentially one in every 556 headlines, which doesn’t seem all that bad, but it has to be consistent. Even now, my .51% makes me #38 overall, saying that one in every 196 stories on TechMeme is from louisgray.com. That certainly doesn’t seem like a lot. It wasn’t celebrity that got me on there. And I can’t say it was a big event. The first time I ever made TechMeme was in March of 2007 with (10 Suggestions to Improve Google Reader). Obviously you have realized one of the easiest ways of getting on TechMeme (not the 100) is to blog about Techmeme and bloggers …. @Louis – as always, thanks for the insight. Your willingness the share the journey is very cool. I don’t know that we get to hear these experiences very often (e.g. where did Michael Arrington come from?). You know, Hutch, I thought this was going to be another “put an RSS icon on your blog” or “write about a niche,” etc. type post, but it wasn’t. I was pleasantly surprised by the simple, yet really effective tip you offered in point 1: “Slow and steady” aka “Long slog”. Never though of it that way, but you’re dead on. I like this a lot. I guess in a way it seems obvious, but you put it into really concrete words and it makes perfect sense. A friend just asked me for a quick way on how he could get lots of people to start noticing his blog. I pretty much laughed and told him to sit back and wait, all while working extremely hard. @Dave – thanks for that comment. I know what you mean on the more toolkits types of advice. Those posts are good, but they don’t really get to the heart of the matter. BTW – nice gig you’ve got there at WPP for a guy so young. @Sues – you are so right. I have another post on here that includes a link about a guy who mastered StumbleUpon to drive people to his site (http://tinyurl.com/4q8h9x). But one conclusion he drew…he wasn’t developing readership so much as he was playing a numbers a game. 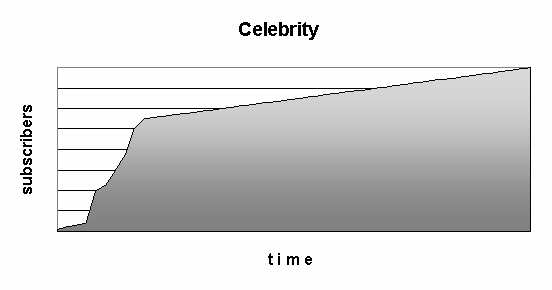 It takes time to develop a following (unless you’re already a celebrity).